Lawrence Arts Center Final Friday events are sponsored by Gould Evans. This Halloween Final Friday will feature a variety of art exhibitions that you don’t want to miss. Over 60 artists from around North America have their work on display. Our bar will feature a spooky cocktail just for Halloween visitors and from 7-9pm DJ Proof will be spinning records. This group exhibition explores juxtapositions whether they be visual or conceptual as well as the connections that can be formed in the context of a group exhibition. The works included in this exhibit looks to the future in order to acknowledge the past. They make connections and blur definitions of ceramic materials, processes. The exhibit delectably and mysteriously explores tensions between nature and the synthetic, the hand and the machine, history and the future. This exhibit brings together nearly 40 artists working in North America, each working with ceramic material and processes. Solo Show by Russell Wrankle. Russell is an artist and a teacher currently living in Southern Utah. His ceramic sculptures play on his personal narrative, utilizing a variety of animal figures. Wrankle says that, like Aesop’s Fables, the animal is an apt vehicle to express human truths. Artist Aaron Hughes began the Tea Project as a response to his military deployment to Iraq and Kuwait in 2003 and his return trip in 2009 as a peace delegate to the First International Labor Conference in Erbil, Iraq. As an artist, teacher, and activist, he works to create projects and scenarios in which diverse groups of people can collectively and personally address difficult topics and create meaning out of trauma. Amber Ginsburg is an artist, editor, writer and lecturer at the University of Chicago. Together with collaborators, Amber creates site-generated projects and social sculpture that insert historical scenarios into present day situations. Her work is strongly influenced by her background in craft and ceramics. This installation will continue to evolve through November 8. This exhibit features a variety of plates and drawings. The contributing artists are from across the United States. The Carnegie Building will be dressed up for Halloween, and so will the historic reenactors who will be joining Freedom’s Frontier National Heritage Area staff, and the Douglas County Heritage Conservation Council at 9th and Vermont, in Lawrence. Douglas County Heritage Conservation Council will have displays. Coloring sheets, and candy for trick or treaters. Other refreshments will also be served. (785) 856-5300. For more information about events and historic sites in the 41 counties – 29 in Kansas, 12 in Missouri – that comprise the Freedom’s Frontier National Heritage Area, visit our Web site at http://www.freedomsfrontier.org. Watch one of our talented artists create spontaneous art in front of Lawrence Hits’ office (lawrencehits.com, thevoiceoflawrence.com and lawrencetv.tv), located at 7 E. 8th Street, just east of 8th & Mass Streets! 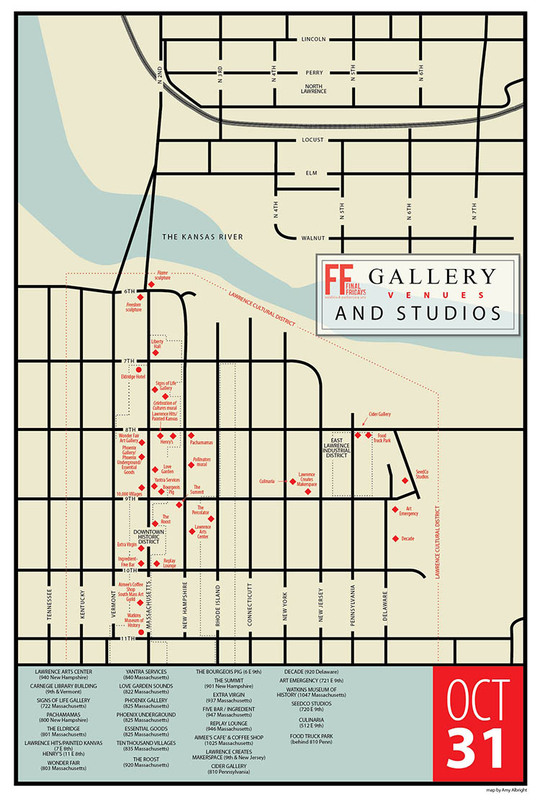 Signs of Life Gallery is located at 722 Massachusetts St. in the heart of historic Lawrence, Kansas. We feature work by dozens of artists to suit a variety of tastes. Many are local, but we also represent artists of national and even international reputation. Our beautiful gallery overlooks picturesque downtown Lawrence and we are convinced you will find it a satisfying place to experience art and cultivate your own creativity. Come in and let us help you find artwork that is a perfect fit for your life and space. Clint Ricketts is a printmaker, painter, and teacher currently living in Lawrence, Kansas. He received his MFA from the University of Kansas in 2010 and has taught design and printmaking courses at Emporia State, Washburn University and Missouri Western State University. Clint’s art has been exhibited locally at galleries including The Wonder Fair, The H and R Block Art Space, The Kansas City Art Institute, and The Invisible Hand Gallery and as a participant in the Kansas City Collection. Clint’s work has also been seen nationally and internationally in the publication New American Paintings and in galleries including the International Print Center of New York, OK Mountain of Austin, Texas, the Coyne Gallery of The University of Syracuse and Hongik University in Seoul, Korea. Nestled in comfy corners of Lawrence- visual art is busting at the seams. Henry’s is proud to welcome and host ‘Hometown Glory’ , photography by Nicholas Maher, this October Final Friday! Stop by this Halloweeny Final Fridays to grab a chat with Nicholas about his work, come sip on a chai latte or an apple cider from the good lookin’ guys upstairs. Nicholas Maher is a student artist based out of Lawrence Ks. He has been studying photography intensively for the past two years. Nicholas grew up in Lawrence and the majority of his photographs are taken locally. He enjoys shooting in the wild and when not in class he can be found on the banks of the Kaw River chasing sunrises and eagles. Most of Nicholas’s inspiration comes from Lawrence’s strange organic vibe. Nicholas is just getting started as an Artist/Photographer this will be his first show. Halloween night, Kansas City artists Dustin Williams and Jon Linn unveil their third installment of the ongoing Ghost Town series. Each October at Wonder Fair, nondescript hallways and dusty back rooms are inexplicably transformed into suspiciously spooky new businesses. In the wake of 2012’s Cemetery Cinema, the haunted video rental store, and 2013’s Dead End Diner (see our grave reviews on Yelp), comes a new installation and a new business/membership card to add to your wallet. Join Phoenix Gallery for October’s Final Friday Art Walk for a special evening featuring ceramic mugs and cups from local artists. Now is the time to start thinking of warm drinks for cooler weather, so this will be a chance to see these great pieces featured for the evening. From small espresso cups to large mugs, we will show you a variety of the work that our local artists create. To add to the evening, we will have the pieces you choose at 10% off and we will include a coupon to take the mug to TCBY and have it filled with free coffee! Enjoy local art and warm up as well! TCBY will also be here at the gallery with food and drink to try. Check out our Phoenix Underground gallery featuring local artists Ardys Ramberg and Stephanie Freeman. This exhibition will be shown throughout the month of November. Phoenix Underground will feature artists Ardys Ramberg and Stephanie Freeman for October’s Final Friday Art Walk. Stephanie Freeman has been painting on and off for forty years. Most recently, she began painting steadily as a means of restructuring her life and healing her grief after losing her sister to cancer. Even though it was very painful to work during this period of mourning, she began painting regularly, embracing the personal artistic growth that occurred. At first she worked with oil paint, producing large, brightly colored abstract works. Gradually, she began experimenting with burning raw canvas. Initially Stephanie was terrified of the fire, but she learned to embrace its restorative properties. She loved the idea of nearly destroying something and, through creativity, resurrecting it. Her current body of work is inspired by the forms brought about by the controlled burning of canvas fragments, which are often incorporated as collage elements in the finished works. She has been reinventing herself since her sister’s death. Like the phoenix rising from the ashes, these paintings are part of her rebirth. Rusty metal pitted by time, weather, and soil–that is what Ardys Ramberg’s show is about. Oiled, to stop the aging process, the textures formed speak to her heart. Ardys’ mentor, George Kaull, disdained the old metal she choose to work with, and he was right. It’s brittle and difficult to weld smoothly, but oh so exciting to look at if you are of her ilk. “Odysseus Spots Circe” is a piece Ardys intended to make years ago. She is so glad it has come into existence. It gave her another chance to visit with Jon Blumb, too! The enclosure in the middle of the room will knock your socks off if you get to see it after several inches of gently fallen snow. Clouds, flying birds, and trees viewed through its “roof” seem ever more magical as you sip tea inside it with a friend. And how delightful it is to construct such things! Ardys sang a song inside it to send it on its way to a new home. Please join us at the opening reception for Kansas City artist Bryan Fyffe on October 31st from 5 to 9 pm. We could not think of a better artist to have for Final Fridays Art Walk on Halloween! Bryan illustrates for Walt Disney’s Haunted Mansion. He will have a never seen before new haunted house piece of work for the opening reception. We hope to see you this Halloween at Essential Goods! Bryan Fyffe grew up with an interest in ghost stories, Star Wars action figures, Godzilla and pretty much anything with the flavor “blue raspberry”. He creates art on a wide variety of subjects, some of his favorites being zombies, Halloween and food. Some of Bryan’s regular freelance clients are Walt Disney and Penguin Books. His digital collage work features many textures and layers. Bryan lives with his wife and two children in Kansas City. You can check out more of his work at http://www.bryanfyffe.com. Much of my work is about natural elements combined with collage, a synthesis of color and texture which is a way of adding beauty and excitement to art, and therefore, to life. Creating silk collage is also a way of making sense of a complex and uncertain world. My work has evolved as a form of expressive mosaics to textile pieces, a combination of still life and symbolic elements of life. Using different materials and the placement of the materials together to create a unique effect is always magical and fascinating process. A self-taught textile artist, it is silk painting that makes my heart sing. Although I have worked in a variety of media in the S.F. Bay area the past 30 years, my focus is wearable art. I was a weaver for many years, and at one time, raised sheep to shear for wool I spun before weaving. A few years ago I transferred my love of watercolor to silk, which is the only fabric that lends itself to watercolor effects. I recently have started quilting silk. A fairly new Lawrencian, I have been a member of the Lawrence Art Guild for three years, during which time I have been a participant in the Guild shows, and have also shown my work through Lawrence Creates, the Library, the Merc, Phoenix, and several other Lawrence businesses. I teach workshops on silk-painting and other fiber arts through Makerspace and other venues in Lawrence. Closed for Halloween. Back next month! This series of landscapes borders on the abstract, focused on the light and dew in the air during the Kansas autumn months. I grew up on the outskirts of Lawrence, between Baldwin and Vinland, KS amidst rolling fields, small creeks and large swaths of trees outlining the landscape. I still spend a great deal of time outside of Lawrence exploring these areas, and still find newness in the landscape that is so familiar to me. I attempt to capture the moments driving by or walking through these areas of light dripping through shadows, hazy mists engulfing the sightline, fields of fire and never ending skies that break from grey to full brilliance. Often the land itself has such surreal depth, I feel I’m squinting or even sleeping inside it. Molly Murphy lives in Lawrence, KS with studios in the Kansas City Crossroads and Lawrence, KS. She currently serves as co-curator of Cider Gallery Fine Arts with her studio partner, Clare Doveton, as well as serving on the Board of Directors of the Lawrence Arts Center and Coordinator of Final Fridays for the City of Lawrence. No Final Friday opening this month. Back next month. Families are invited to visit the Watkins for trick or treating, and go on a short scavenger hunt for prizes. Our exhibit opening that night is titled La Catrina Speaks: Political Discourse and Dia de los Muertos. Artifacts on loan from the Spencer Museum of Art are used to show how the Mexican holiday Day of the Dead gives voice to political, cultural and social concerns. Artifacts drawn from the museum’s collection illustrate how residents have expressed their political views. By exploring how citizens in the past expressed their concerns, La Catrina Speaks encourages Lawrencians to voice their beliefs on today’s important issues. Join us on Halloween night for openings and special events in the Warehouse Arts District from 5 until 9 pm. Please join us on Halloween night, Friday, October 31st for our Final Friday reception for Jack Collins and Cheryl Toh. In this two-person show, connections are made both with the artists’ processes and visual results of their work. While Jack Collins assembled this series of paintings with wood, screws, and glue, Cheryl Toh assembled her work with a sewing machine, allowing the lines of thread to generate shapes. The resulting images from both artists are striking yet subtle nuances of color. painting. Her work depicts an ongoing observation of the varying levels of communication within macro & micro communities. Toh’s work then moves forward within a set of parameters – distilling, interpreting and transforming the observations she has accumulated through the use of organic symbology. Originally from Connecticut, Toh received a Bachelor of Arts from Elms College in Massachusetts with additional training at Penland School of Craft, Penland, NC; Gage Academy and Pratt Fine Art Center both in Seattle, WA. She was awarded residencies at Escape to Create in Seaside FL and with the Charlotte Street Urban Culture Project, KCMO; she was also ArtsKC Inspiration Grant recipient. Toh regularly shows throughout the U.S. and her work is found in public, corporate and private collections. Kansas City artist Jack Collins is a mixed media painter. He works with the idea that wood planes on the canvas and negative space around these objects are in the process of entering and exiting the two dimensional plane of the composition. Collins works with the interactions of positive and negative space, or figure and ground, creating an illusionistic space. For the last year and a half, Collins has incorporated wood into his paintings, which offers him new challenges in his progression from using paper. Collins received an MFA in painting from the University of Kansas in 1990, and has been exhibiting in Lawrence and Kansas City for several years. He is the recipient of two grants from the Kansas Arts Commission, as well as the Faculty Growth and Enrichment Grant from Baker University. SEEDCO STUDIOS– Located within the Warehouse Arts District at 720 E 9th Street #2 in Lawrence, KS, this space is ideal for making, showing and engaging in all aspects of art. With 19 artist studios, a music recording operation and collaborative space/gallery, the potential for creating at all scales is practically limitless. SeedCo is envisioned as a creative factory/laboratory with each of the resident artists bringing their singular artistic identity and prowess to expand and delve deeper into conception and production. At the heart of this project is a conscious intent to transform post-industrial space into a fluent medium all its own, specifically designed to transcend temporal and spatial values and condense them to create a heightened sensory experience. A multi-disciplinary approach emphasizing cooperation, collaboration, and community involvement and encompassing elements from fine art, sculpture, graphic design and production, music and recording, fashion, construction, digital media, and street art, the scope of this endeavor is far-reaching, but the flavor is distinctly home-grown. With its placement in the center of historic redevelopment, SeedCo Studios has the chance to act as a catalyst for creative growth, not only in Lawrence proper, but radiating outward into the surrounding regional area and beyond. Culinaria Food and Wine is back for October Final Friday!! We’ll be open October 31st, in a pop-up restaurant/art gallery capacity. Join us for dinner, great local art, and to see our beautiful event space. ART: Featuring the debut photography exhibit of, Sophia Coen. Photos will be up throughout November, and can be purchased at Final Friday October 31st, Wine Club on November 19th (with reservation), or by appointment most Tuesdays/Thursdays from 2-4 pm. Sophia Coen is a Lawrence, KS photographer whose show for Final Fridays, titled “Just a Pose,” is a collection of portraits that play with texture, color, light and setting to paint an overall picture of beauty and disconnect. Her focus on juxtaposition and her still-life approach allows her subjects to become elevated to editorial status, but not without a sometimes quiet, sometimes bold resistance. We’re located in the parking lot at the NW corner of 9th and New Jersey. Rachael Perry is taking portraits for the Lawrence Inside Out project. Art Gallery in the heart of the East Lawrence Art District. This is a big warehouse undergoing an awesome transformation to become one of the next great galleries in town. Come visit us to see the tremendous talents of many local artisans displaying their fine art, street art and sculptures. We are the giant green warehouse on the corner of 9th and Delaware, next to Star Signs. Free entry, live music, adult beverages, and no dress code, see you on Friday!